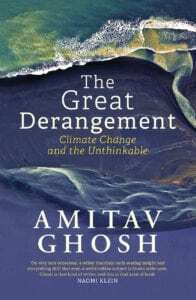 Amitav Ghosh ’s new non-fiction work – the Great Derangement – Climate Change and the Unthinkable, is a tour de force. Written lucidly and forcefully, it does not shy away from stating what many of us know to be true, in our hearts and minds, about the greatest catastrophe to face us all as individuals and as societies. For me personally, both as a writer and as a wealthy person with the associated responsibility of that wealth, it brought both clarity and nuance to many half-baked thoughts and conversations on climate change, and personal and societal responses that I have had over the years. I hope this book will spur renewed and reframed discourse around the globe. Ghosh uses this slim offering – which is a knitting together of four lectures he gave in the fall of 2015, to make a call to action. The primary actors are to be writers of serious literary fiction. He argues that the climate crisis is a crisis of culture and thus of the imagination. When future generations look back, he writes, they will believe that our time was one “when most forms of art and literature were drawn into the modes of concealment that prevented people from recognizing the realities of their plight.” And that’s why this era will be known as the Great Derangement. Ghosh traces the history of the modern novel and compares its journey with those forces of empire and capitalism that drew us into the vortex of the climate crisis. Just at a time when Nature was making her voice heard in the shape of uncanny extreme events – storms and floods and earthquakes, the modern novel was receding into the quotidian and the predictable. As the vast improbable unfolded around us, most writers drew us tighter into ever smaller circles of individual mindscapes, reducing and concealing the reality of larger landscapes. Eventually, all writing about the unknown and the unknowable has been banished into the exiles of ‘fantasy’ or ‘science fiction’. There are many rich threads that Ghosh weaves into this tapestry. He asks bold new questions. Did imperialism actually retard climate change by preventing the colonies from expanding their economies? Since security establishments of powerful modern nation states recognise that the climate crisis will alter the global distribution of power, is status quo the real plan? Has the resurgence of Asia bared its own complicity and silences? He also presents a piquant moral poser. Are some of our most treasured ideas about political virtue such as “Be the change you want to see?” completely inadequate? For all Gandhi’s personal austerity, and even though he embodied the consumption patterns that would get carbon emissions down, he could not succeed in preventing India from embracing the path of consumption-led growth. For all Al Gore’s single minded championing of the cause of greenhouse gas emissions control, his personal lifestyle has been relatively lavish, and media has unleashed detailed descriptions of his personal swimming pool and energy consumption. Ghosh rightly argues that neither individual can be blamed. In fact, by focusing on Gore’s lifestyle rather than his message, we give the climate deniers the exact diversionary tactic they need. Both Gandhi and Gore have forever etched in the public consciousness the discourse on consumption, on growth and the consequences for the planet. But no individual can be held responsible for curating the path forward. This requires new forms of governance both at the community level and at the global level. Ghosh sadly, does not suggest how these will emerge, but then his focus is mainly on nudging fiction writers to spur such imagination. Amitav Ghosh brings some of these questions to a climax by then comparing two important documents of the past year – the Paris Agreement and the Laudato Si’ of Pope Francis. One continues with the derangement. “The very syntax is an expression of faith in the sovereignty of Man and his ability to shape the future.” The other acknowledges “how profoundly humanity has lost its way and of the limits that circumscribe human agency” and reminds us that Man is spirit and will but also Nature. Ghosh concludes on a note of optimism mixed with irony. He hopes that religious groupings joined with popular movements for equity and justice will halt the momentum of destruction. And he explores the irony that “the ever-shrinking time horizon of climate change” will isolate and thereby preserve the culture of communities in some parts of the world. It will be the communities who have retained their healthy respect for nature’s might, their material skills, their relationship to the land and to their people, who will survive best. And poetic justice will be done. Prose will have to follow. Ghosh ends on a rather romantic note. A new generation will be born, will transcend the isolation of the Derangement and create the new forms of art and literature that will reimagine the Anthropocene. Quills on the ready, anyone? Rohini Nilekani is the founder of Arghyam, a foundation dedicated to water and sanitization issues. She is also co-founder of Pratham Books. A dedicated philanthropist, Rohini is involved with a number of environmental and developmental organizations such as ATREE. She is also a writer of both fiction and non-fiction and has authored the novel, ‘Stillborn’.